Research has devoted considerable attention to the contribution of culture and creative industries (CCIs) to the economy and society (KEA 2006). CCIs have been first analysed as a sector contributing to wealth and jobs (KEA 2006; Throsby 2001; UNCTAD 2008 and 2011, among the others) and, lately, as an industry having important spill over effects on “non-creative” sectors (KEA 2009; Bakhshi et al. 2008; Pratt, Jeffcutt 2009). Richard Florida’s work (Florida 2006; Florida 2002; Florida & Gertler 2002) has drawn renewed attention to the economic dimension of cultural and creative resources and investments, especially in terms of innovation and competitiveness. Cities and regions and their respective identities play a vital role in fostering the different and the creative which in turn has a broad impact on innovation, SMEs, local development, social cohesion, branding, attractiveness of the city as a place to visit, invest and live in. The ‘creative community’ is often attracted by the cultural amenities available in large urban areas (Florida). The use of public funding increasingly requires measurement tools both to justify investment in the eyes of taxpayers and to assess economic and social impact of CCIs. Nevertheless, creativity remains an elusive subject for policy makers. To date impact assessments and evaluations of CCIs policies have been limited in number. One of the major obstacles in adopting CCIs’ policies is the difficulty in apprehending the value of support actions for cultural and creative enterprises. CCIs are often overlooked in official statistics and this is one of the key challenges in trying to measure the economic contribution of this sector. Furthermore, local policy makers and officials dealing with culture often lack a “culture of evaluation”. The EU is calling on European local and regional authorities to make better use of EU funds for the development of territories through the CCIs (“Regional Policy contributing to smart growth in Europe”, 2010). 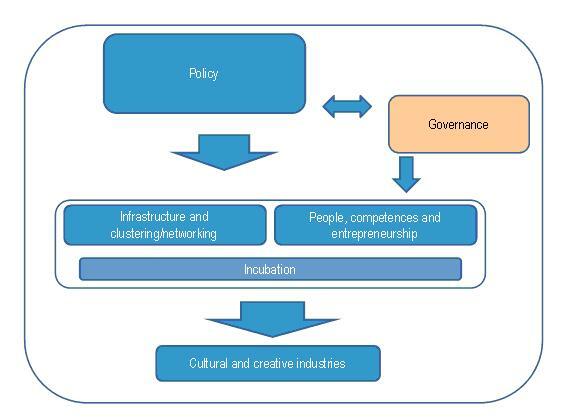 Regions are being asked to develop “strategies for smart specialisation” (RIS3) (Smart Specialisation Platform Guide 2011) which should integrate CCIs via a “creative ecosystem” promoting traditional cultural assets as well as CCIs’ spill over effects into the local industry. The next generation of EU Structural Funds 2014-2020 will be accessible under the condition that smart specialisation strategies are in place at national and regional level. The EU is also inviting policy makers at all levels to develop assessment tools and collect data supporting the design of evidence-based policies (“Green Paper – Unlocking the potential of cultural and creative industries”, Smart Specialisation Platform Guide 2012, umbrella programme proposal “Creative Europe” for CCIs). Evidence is needed to justify and prioritise public spending, especially in a time of crisis. 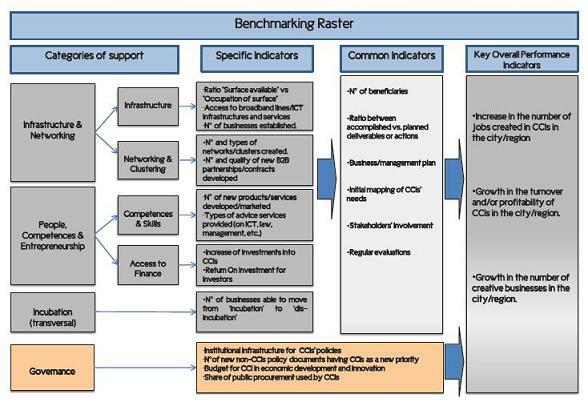 The benchmarking raster (the raster) is a set of indicators to measure policies focusing on local economic development through CCIs. The raster has been conceived as a user-friendly tool aimed at gathering data to assess the economic impact of CCIs policies and the “value for money” of support actions as well as facilitate the design of evidence-based policies for CCIs at local level. Adapted to the specifics of CCIs and mainly focused on policy instruments which impact on economic and business development (as opposed to social and cultural impacts), it may be used both in small and large urban centres. The raster has been commissioned to the KEA team by the INTERREG IVC CREA.RE network (Creative Regions: The European network of local and regional authorities for the better involvement of cultural and creative industries in EU regional programmes) which comprises 12 local and regional public authorities from 10 different EU countries(2) representing small and medium-sized urban and rural areas. The network aims to better involve the creative sectors in the development of European regions and urban centres and to find means to better access and justify the use of EU structural funds for CCIs. The raster will contribute to CREA.RE’s objectives. The selected are expected to provide useful information to help the European Commission (EC) as well as regions in Europe to decide on the role of CCIs in the EU Structural Funds. Our methodology is based on a multi-method approach (we used a multiple choice questionnaire and interviews to gather both qualitative and quantitative data) which aims at enriching and cross-validating our findings. We first identified existing support measures (for CCIs but also for other sectors and which coulc be applied to CCIs) based on desk research and classified them under different categories of support. Secondly, we selected a number of good practices (15) as practical examples of support measures which also allowed us to look at the use of indicators in local contexts (which we observed quite rarely). – Providing promising and/or interesting elements in terms of coherence with a local policy plan; management structure and stakeholders involved; overall impacts. – Mainly but not exclusively based in small and medium sized areas (based on EUROSTAT definition(3)). At the same time, we compiled a list of indicators based on literature review and in relation to the previously identified support measures and categories of support. Culture experts were also consulted through questionnaires and interviews. They were mainly identified through the selection of the good practices. The benchmarking raster has been tested and validated by CREA.RE members who reported back in six months time (November 2011). The KEA team has improved and finalised the indicators on the basis of their comments. KEA added guidelines on the kind of data to be collected, on data sources and recommendations on a “user-friendly” format to be used. Public authorities increasingly put policy strategies and measures into place to support the development of local CCI. These policy measures are either CCI specific or part of other policies intended to foster economic development – including as part of EU structural funds national or regional programmes(4). However, an “official” categorisation of policy support measures (for CCIs at least) does not exist. 4) Measures relating to governance stemming from the way policy measures are established and implemented. The benchmarking raster that follows is the one validated by the CREA.RE’s members during the testing phase. It takes into account the variety of existing support measures and develops indicators accordingly to the identified categories of support measures. Indicators are aimed at measuring the performance of CCIs’ support measures at three levels: governance, single support actions, and combined support actions (notably incubation). In the raster we also distinguish the key performance indicators that help assess the overall contribution of CCIs’ policies. – 3 key performance indicators focus on the overall contribution of support measures to establishing a creative ecosystem. – 16 indicators on support measures or on the outputs and outcomes of the measures. – 4 indicators on governance to assess how policies for CCIs are established and implemented. The raster is a tool aimed at assessing the creative potential of cities and regions and selecting the best policy measures to support the sector. It should be used by local and regional actors to show decision-makers the importance and value of CCIs for local economic development and support the design of evidence-based policies. Its ultimate purpose would be to help cities and regions to establish “smart specialisation strategies” focused on CCIs’ growth potential and access the new generation of EU regional funds. The proposed benchmarking raster is a first step towards the definition of an appropriate evaluation model for CCIs policy at the local level. The next step will be to test this prototype widely, in the framework of comprehensive evaluation strategies covering a longer period of time. Future research should explore the development of indicators covering cultural participation, well-being, social cohesion, local attractiveness, tourism and branding. Indeed, the value of investment in culture is far broader than local economic development. (2) Cultural department – Office of the State Government of Upper Austria (AT), Regional Council of Central Finland (FI), District Administration LüchowDannenberg (DE), Municipality of Narni (IT), Agency for the Promotion of Tourism in Umbria (IT), Poznan City Hall (PL), City of Medias (RO), Province of East Flanders (BE), Maribor Development Agency (SI), Region Västra Götaland. (4) Examples across Europe and beyond include for instance: Creative Tampere Programme 2006-2011 (Finland), Vision on the Creative Economy 2007 (Rotterdam; The Netherlands), National Strategy for European Structural Funds 2007-2013 (Estonia), North Rhine-Westphalia – Objective 2 ERDF Programme (Germany), Baden-Württemberg – Objective 2 ERDF Programme (Germany), Culture and Space Action Programme 2007-2013 (The Netherlands), Vision – Cultural Policy for Region Västra Götaland (Sweden), West Midlands Cultural Strategy 2001-2006 (UK), Manchester Cultural Strategy 2002-2012 (UK), City of Amsterdam’s Arts Factory Policy – Art Factories Programme for 2008-2012 (The Netherlands), Create Denver (USA). Bakhshi, H., McVittie, E. and Simmie, J., (2008), Creating Innovation. Do the creative industries support innovation in the wider economy?